For our standard services and general enquiries, you can email Bryan at bryan@thesmartlocal.com. 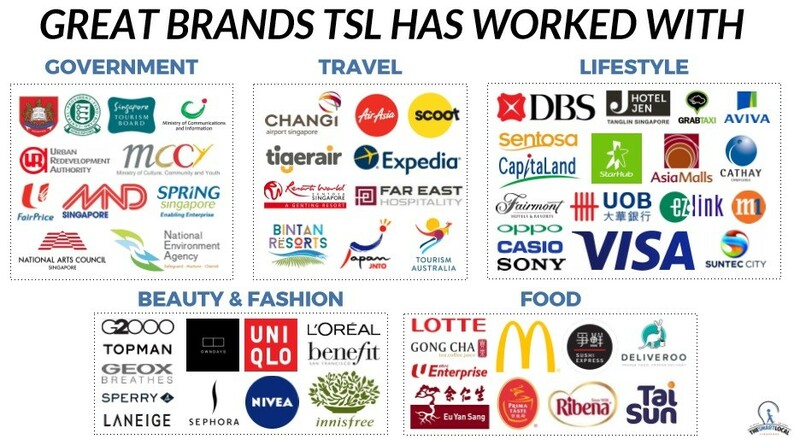 If you're unfamiliar with TSL or digital advertising, please read on for an extremely thorough explanation! Traffic estimator SimilarWeb ranks TSL as the most read lifestyle publisher in Singapore. We're a 'creative agency', 'production house' and 'media publisher' all rolled into one. We first help come up with a customised marketing strategy that matches your brief. Then, we create the media with our in-house talent of writers, directors, designers and so on. 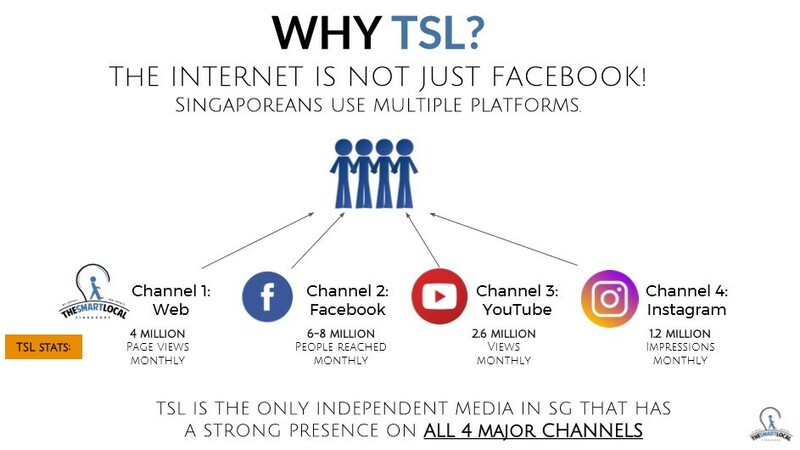 Finally, we distribute this across our channels - which reach over 3 million Singaporeans a month. Doing everything in-house means quality is kept consistently high. You get content out faster as there's only one point of contact and everyone is aligned. This enables us to translate urgent briefs into published content as fast as one day after receiving the brief. We work with major media agencies, government boards and MNCs, exceeding KPIs and helping our clients and partners win awards and recognition - like in the below examples with Canon and Singtel. Examples: Mumbrella Story | Marketing Interactive Story | Top YouTube Ads 2016 | SMA Award Winner 2017 | Top YouTube Ads 2017. In 2018, we were recognised by Mumbrella Asia Awards as one of the top 5 Media Brands of the Year and were up against heavyweights like CNBC, South China Morning Post and VICE Asia. We were extremely honoured to have won the title of 2018 Media Brand Of The Year. 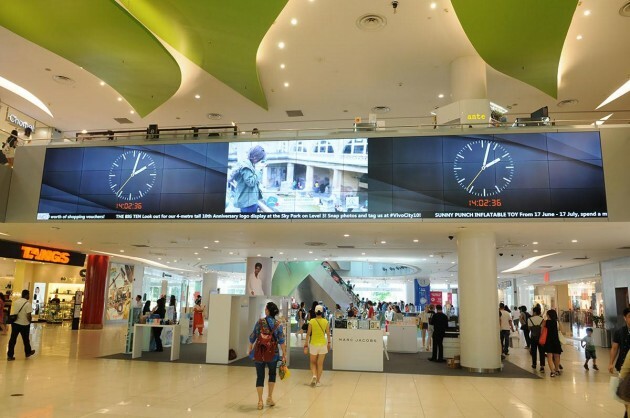 After the digital push, clients also have the option of using our videos as media assets for outdoor advertising, like the video above displayed at JCube. Other clients market the videos on Facebook before showing them in cinemas, as inflight entertainment or on television - getting amazing value out of their advertising. Apart from the digital push on our YouTube channel and Toggle, our 10-part series The $100 Nomad was shown on prime time TV at 8pm on Channel 5. The show is also been shown regionally in 4 different markets across Asia. It's not easy to stand out from the clutter on the Internet because users have choice and nobody wants to see hard-sell explicit advertising. This is where our content strategy team comes in. They work closely with clients to conceptualise a creative way to market messages using a soft-sell "branded content" approach. We specialise in creating engaging content that gets social media buzzing and people talking. Here's an example of such a branded content article we did. The engagement below is completely organic. People don't hate ads. They hate bad ads. So when you do content right, people appreciate it tremendously. Here are some of the positive sentiments readers have associated with our clients when advertising is done right! 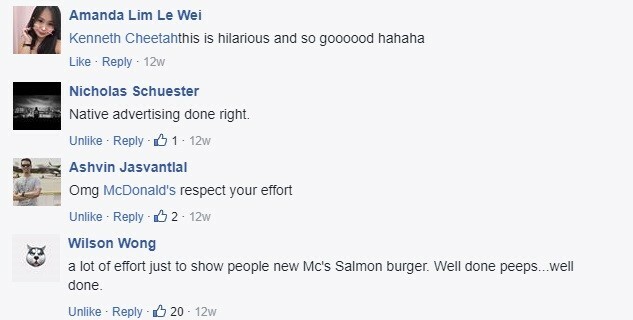 Here's another example with McDonald's which accumulated over 13,000 Facebook shares. Our talented team includes hosts, voice-over artists, designers, actors, writers, researchers, content strategists, videographers, directors, photographers and so on. This content will then be disseminated to up to 600,000+ followers through our advertising channels below. TheSmartLocal averages over 2.3 million sessions from over 1 million unique visitors each month, with 65% of our readers being regular, returning readers. For comparison, big local online magazines/portals typically get 200k visits monthly. Just input your favourite website into SimilarWeb.com to get a good estimate of a website's traffic. Brands today struggle to get 5% of their fans reached on their organic posts. 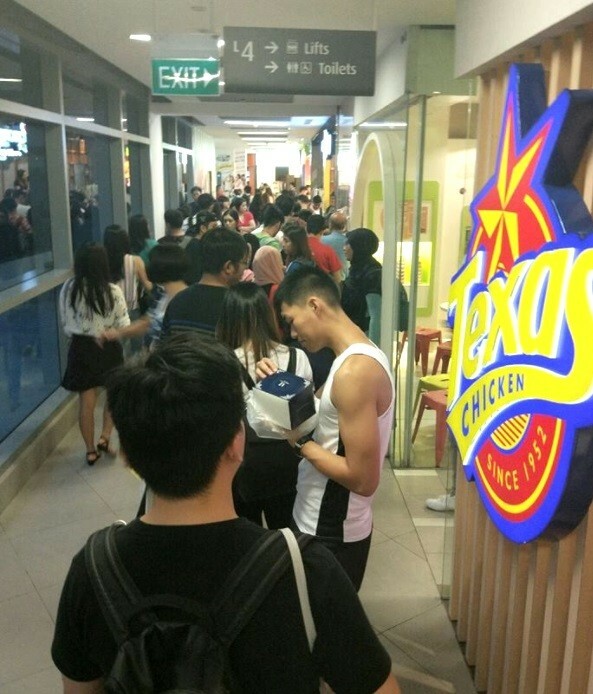 Our stories regularly go viral in Singapore and beyond. Every story we cover will be amplified on our Facebook page to over 370,000+ followers. Age demographics on our Facebook are similar to our website. 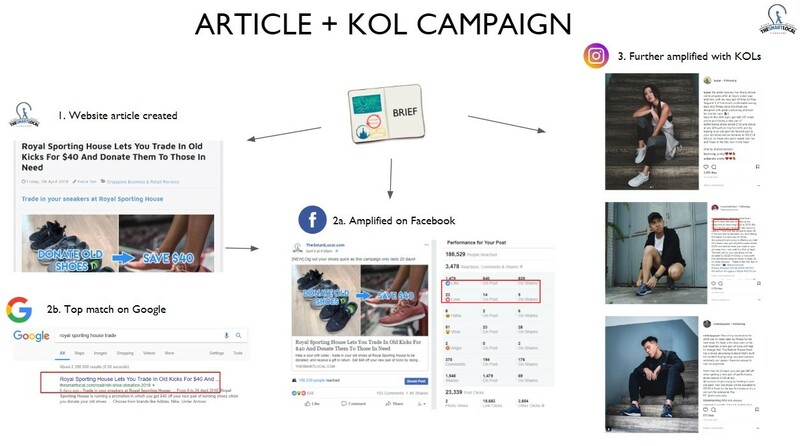 In addition, we ensure every advertorial hits its target guaranteed views - if it doesn't do so organically, we will boost the posts on Facebook at our own cost, guaranteeing your story is seen by a mass audience. We have also introduced advertising options through Facebook videos and Facebook Live. We do the filming and distribution, and you're allowed to retain the video as an asset for your own social media promotion. Here are the organic statistics of one of our FB videos. We also offer YouTube Live streaming as a service, with talents, videographers, and backstage admins to manage the whole event smoothly. Here's a GIF of our behind-the-scenes monitoring. Here's a full behind-the-scenes look at a YouTube video so we can see how many comments we get every second. Our live streaming is advanced with multi-camera views, set design, prepared scripts, and prepared artwork. We highly recommend YouTube streams over Facebook streams as they get 200-400% more concurrent viewers. We have an Instagram following of over 96,000 - one of the highest in Singapore for a non-individual account. When a company advertises with us, we create interesting and original media on our Instagram to reach more people on yet another channel. Play the video above to get an idea of the standard of media we create. Additionally, we'll take care of the arrangements for additional KOLs if you'd like more reach on Instagram from our personalities. We create beautiful media that opens up the avenue of video marketing to our 200,000+ YouTube subscribers. Here's a video from the "Discover Indonesia" campaign we did for Changi Airport. We promoted 5 Indonesian destinations to Singaporeans through compelling editorial content, video travelogues and social media. The campaign received over 2 million views in total across the 4 channels after the first two months. The next year, Changi Airport Group engaged us again to create a 4-part series which also performed well, and our videos were played in Golden Village cinemas. Our videos also shown across shopping malls and buildings as part of the content strategy of shopping malls. Lifestyle malls just want good content to show on their screens, and turn to us for content. Here is another advertorial video we did for a client, NTUC. TheSmartLocal readers are made up of Singaporeans looking for ideas on what to do in and out of Singapore. We cover the best activities, travel ideas, hotels, restaurants and so on and promote good finds and promotions to Singaporeans. These are our demographic figures over a large sample size. 85% of our traffic is from Singapore and 80% of our readers are between 18-35 with slightly more female readership (63%). Our biggest group is aged 25-34 - the young working adults. This makes up a hefty 42% of our reader base. You can request our full media kit by sending an email to Bryan at bryan@thesmartlocal.com. 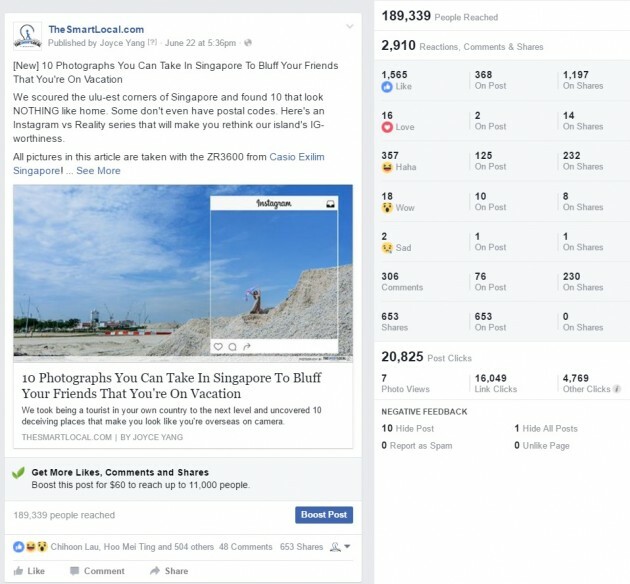 A single viral post of ours can exceed 100k pageviews, which is more than the monthly circulation of most magazines and more than the readership of most websites in Singapore. Yet we charge a fraction of the pricing on print media and our results are measurable. You'll get a detailed report of your campaign at the end, down to industry benchmark comparisons. The best part? Unlike traditional media where the time-frame of your advertising is limited, these posts created by us last FOREVER on the internet. 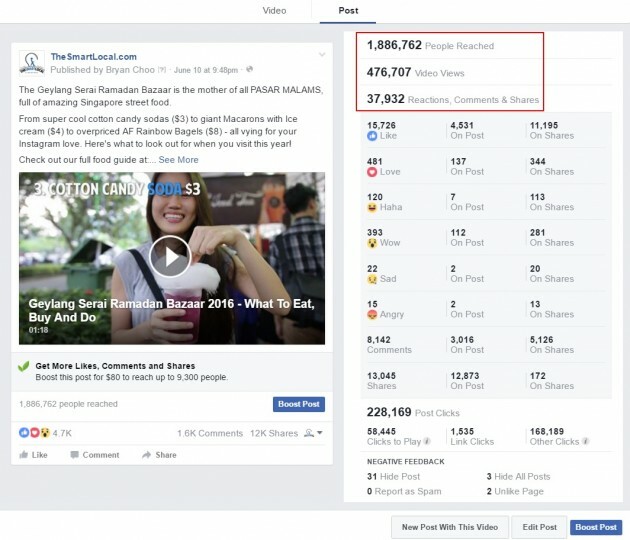 For smaller companies and new advertisers, we recommend trying out our basic sponsored post first, like the ones we created for Old Chang Kee and Gong Cha Singapore that performed well, and more importantly made consumers think more about the aunties/attendants they interact with at kiosks. This comes with social media amplification on our Facebook page. Drop us an email Bryan at bryan@thesmartlocal.com to get started. We also provide other digital services but it's our traffic and reach that you want to utilise. Some of our reviews have been highly influential - a positive review went viral and caused so much hype for the restaurant that all the local newspapers covered the queues it was getting. Our advertising translates into real-world results which are sometimes so huge they block the entrances of their competitors. We have had the privilege of working with many MNC companies, large businesses, agencies and home-grown local companies. We also have a long collection of testimonials that can be seen upon request. Should you wish to receive our latest media kit, have a look at previous case studies or have any further questions, feel free to call our office or send an email to Bryan at bryan@thesmartlocal.com. And if you want to learn more about digital marketing in Singapore, check out my digital marketing blog.